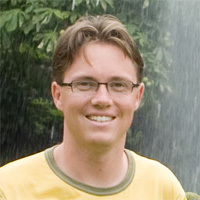 Matthijs van Leeuwen is a former member of the ADA group. He currently holds a post-doctoral researcher position in the Machine Learning group of the Katholieke Universiteit Leuven, you can find his current web page here. Matthijs was a Ph.D. student in the ADA group from September 2005 to December 2009 and defended his thesis 'Patterns that Matter' on February 9th 2010. After that, he became a postdoc working on the Exceptional Model Mining (EMM) project in the same group. In September 2011, he left the group and started in Leuven. van Leeuwen, M. & Knobbe, A.J. Diverse Subgroup Set Discovery. In: Data Mining and Knowledge Discovery, special issue ECMLPKDD'12, pp 242-208, Springer, 2012.
van Leeuwen, M. & Knobbe, A.J. Non-Redundant Subgroup Discovery in Large and Complex Data. In: Proceedings of the European Conference on Machine Learning and Principles and Practices of Knowledge Discovery in Data 2011 (ECML PKDD'11), 2011. Duivesteijn, W., Knobbe, A.J., Feelders, A. & van Leeuwen, M. Subgroup Discovery meets Bayesian networks – an Exceptional Model Mining approach. In: Proceedings of the 10th IEEE International Conference on Data Mining (ICDM'10), 2010.
van Leeuwen, M. Maximal Exceptions with Minimal Descriptions. In: Data Mining and Knowledge Discovery, special issue ECMLPKDD'10, vol.21(2), pp 259-276, Springer, 2010. Siebes, A., van Leeuwen, M. & Vreeken, J. MDL for Pattern Mining. In: Proceedings of the international conference on Statistics for Data Mining, Learning and Knowledge Extraction Models (IASC'07), 2007. Koopman, A.C.M., van Leeuwen, M. & Vreeken, J. Exploring Temporal Memory of LSTM and Spiking Circuits. In: Future of Neural Networks workshop 2003 (FUNN2003), 2003. Zufferey, J.C., Floreano, D., van Leeuwen, M. & Merenda, T. Evolving Vision-based Flying Robots. In: Proceedings of the 2nd International Workshop on Biologically Motivated Computer Vision 2002 (BMCV'02), 2002.
van Leeuwen, M. Spike Timing Dependent Structural Plasticity, in a single model neuron, M.Sc. Thesis, Institute for Information and Computing Sciences, Utrecht University, 2004.
van Leeuwen, M. Evolutionary blimp & i, Internship report. Institute for Information and Computing Sciences, Utrecht University, Universiteit Utrecht, 2002.